i would really like to see you post your design files… Im pretty much on the exact same project and that would save me a decent amount of time. I will post code and layouts etc soon. I’ve been distracted with other projects…. The design has changed quite a bit since my prototypes. More in a few days. Thanks. I am also very interested in building a diy dro system. 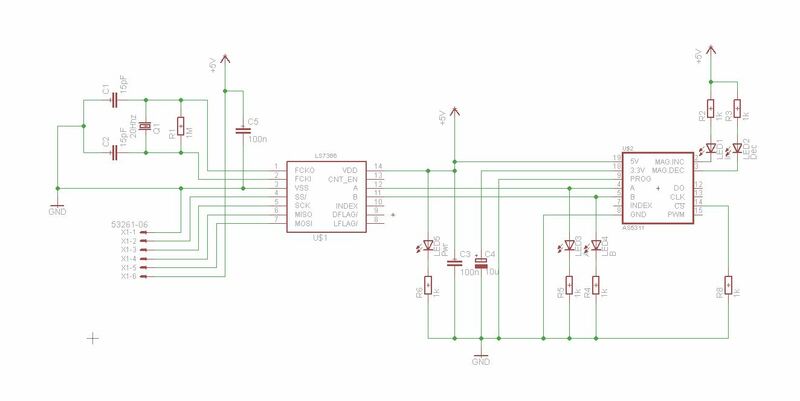 What program did you use for the schematics and board layout? Is there a board schematic available so that I could get my boards manufactured locally? I used Eagle for the schematics and PCB layout. I get my boards made at oshpark.com. Easy to use and free shipping. I’ll be posting an updated design shortly. Sure. I sent you an email. great build. however I am struggling with the type of magnetic scales you use? were to bu those. I might of missed them being discussed since I haven read all the post yet, but I really, Really like you concept here! For about US $7.50. For longer lengths, I purchased direct from Bogen in Germany. They have a minimum quantity requirement. There are a few other places that also supply it. The tape is multi pole tape with 1mm pole spacing. See the AS5311 datasheet for more info.